The 3D Viewer is inaccurate. This cloak is not black with gold trim. More of a rustic brown with teal and gold trim. Screenshots show it better. There's a lot of people wondering what it takes to replace their MoP Legendary cloak. For instance, I still had mine when my average item level was 639. As a Combat Rogue, I had Fen-Yu upgraded to 4/4 616. 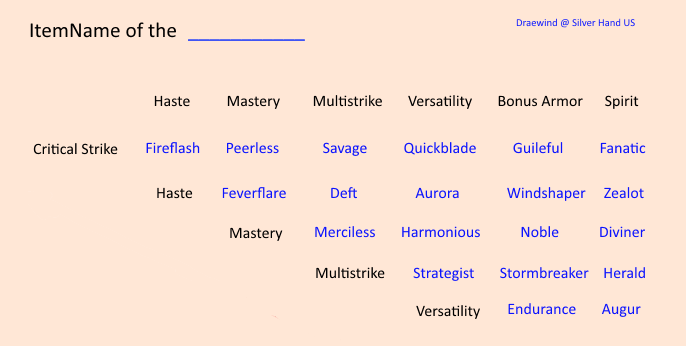 Since I figured that Multistrike is the closest thing there is to replacing the Flurry proc, I checked through Wowhead's database for raid drop agility cloaks with Haste+Multistrike. Guess what? NONE! Not a single one! This means that THIS cloak (and the LW equivalent) crafted to randomly have an "of the Deft" suffix is the only AGI+Haste+Multistrike cloak in the game. Astonishing, but true. Changing from the 616 to the 670 raised my average item level by 3 points, so I stuck with the "Deft", despite it routinely posting slightly lower DPS figures than the cloak 54 item levels below it. Maybe with 680 upgrades around the corner, this cloak MAY become an exact replacement for the legendary. Fun fact: it changes color on upgrading. It's red at ilevel 640, turns blue along the way and is black at 715. If you're looking at the Stage 2 iLvl 655 version of this cloak for transmog, keep in mind it actually appears purple, not blue, in most environments. The same goes for the Stage 2 version of Wendiger polierter Umhang.